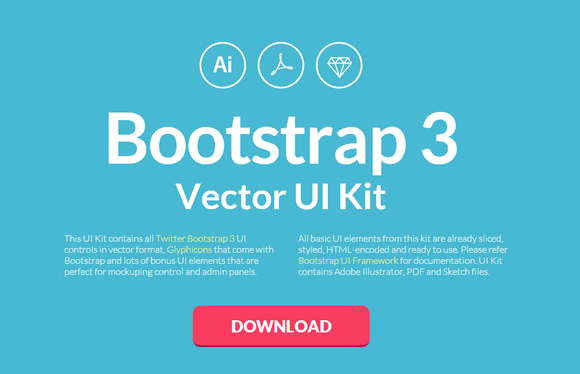 Bootstrap 3 Vector UI Kit contains all Twitter Bootstrap 3 UI controls in vector format, Glyphicons that come with Bootstrap and lots of bonus UI elements that are perfect for mockuping control and admin panels. All basic UI elements from this kit are already sliced, styled, HTML-encoded and ready to use. Please refer Bootstrap UI Framework for documentation. UI Kit contains Adobe Illustrator, PDF and Sketch files. If you need this then you don’t really understand what bootstrap is and you’re wasting time. Really? I suppose you’ve never heard of the concept of wireframing?? When I’m brainstorming with a client, he or she is not interested in waiting for me to code layout revisions. Being able to load a UI into Pencil and change design on the fly is actually fantastic! By the way, the link is dead. I agree with gautch. You are using bootstrap wrong. I love bootstrap, but I don’t want my sites looking like bootstrap. You don’t need vector graphics for wireframes, stick with balsamiq or fireworks. Bootstrap wire-framing isn’t about buttons. Its about layout. But continue to do it your way. My customers will thank me. Less of a need, more of a want. It helps when working with remote developers that need designs laid out in very explicit detail. Why not use the actual bootstrap elements if I can have them just next to my artboard?